The good news: Eli use is growing! More students and teachers are using Eli this fall than ever before and the Eli creative and development teams couldn’t be happier that more people are learning about review. The bad news: growing pains! As more instructors and students are using the system we’re finding spots where Eli is being pushed a bit farther than we anticipated. But we’re on it! The first such problem to surface is in how instructors get students enrolled in courses. The current implementation enables instructors to invite students to join their course either via an email or by giving students a secret code that, when redeemed, would automatically enroll them in the course. The old version of the Add Students interface which gave instructors the option to email students an invitation or give them a secret code they could use to access the course. We’ve heard from several instructors that the email interface crashes when they try to send invitations to their students. We’ve heard from others that handing out unique secret codes to individual students is time consuming and frustrating. This will not do. Send students to https://elireview.com and sign in (or sign up for an account if they don’t already have one). Give students the secret code for your course (you could send it to them via email or write it on the board). 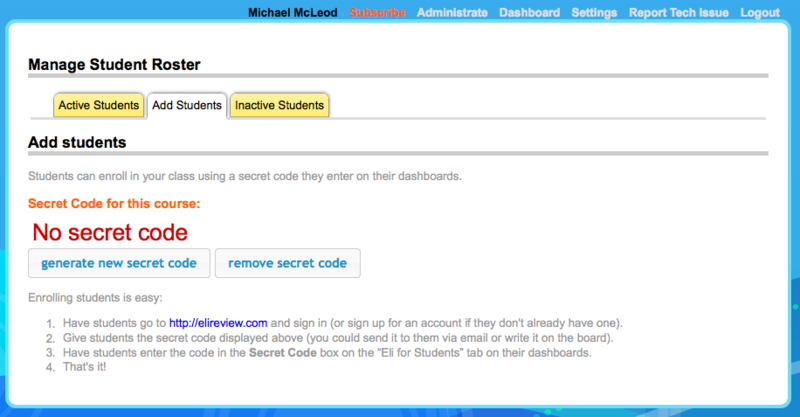 Have students enter the code in the “Secret Code” box on the “Eli for Students” dashboard. That’s it! Students are enrolled in your course. They will still need a subscription to participate in assignments and reviews, but their enrollment is complete. 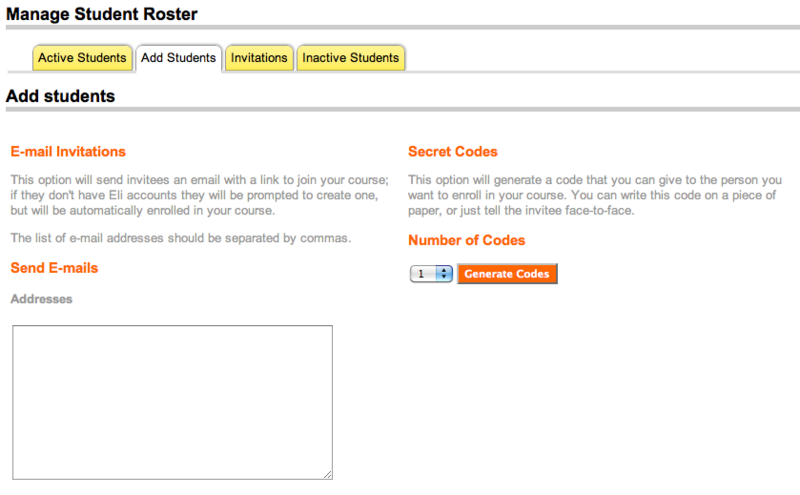 The new version of the Add Student interface that gives you a single access code for the entire course – much simpler! While we’re sorry to see the option to email students from inside Eli disappear, we think these changes will make the process of enrolling students quicker and easier. If you want to invite students via email, you can use your personal email account or your course management system (ANGEL, Blackboard, etc). Just make sure your message contains a link to Eli (https://elireview.com) as well as the secret code for your course (found on the “Add Students” tab of the “Manage Students” interface). Thanks to all of the users who helped us identify and solve this problem! Enrolling Students in Eli Courses was published to the Eli Review Blog in the categories Feedback, UX.